Citric acid, silicon dioxide, calcium silicate and sucralose. As a dietary supplement, mix one serving (1 scoop) into 6-12 ox of ice cold water and consume during or after your workout. To accelerate results, an additional serving can be had. Do not consume more than three (3) servings in a 24 hour period. This product is only intended to be consumed by healthy individuals over the age of 18 years. Consult your physician prior to use if you are pregnant or nursing. Consult your physician prior to use if you are taking any medications or have any medical condition. Do not exceed recommended use. Improper use will not improve results. Discontinue use and seek professional assistance immediately if you experience unwanted side effects. Discontinue use 2 weeks prior to surgery. Keep out of reach of children. At Sparta Nutrition, we understand that not all supplements work for the keto lifestyle athletes out there. That is why we created a line of products designed to maximize your performance, while also ensuring that your state of ketosis is enhanced -- not disrupted! 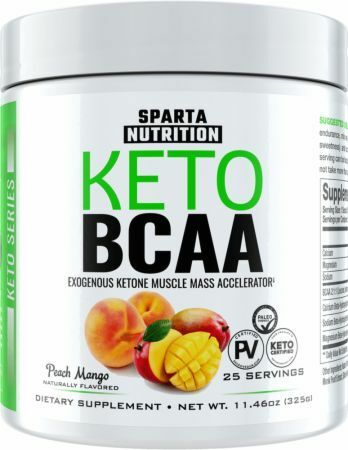 The Sparta Keto Series is the ultimate line of keto-friendly supplementation. The Keto Series was designed to help you as a hard-training athlete while utilizing a nutrition protocol with minimal or zero carbohydrates. We understand that training is difficult when getting into ketosis. Stored glycogen disappears, electrolytes are low, and we can't cheat with carbs. We also understand that some protein and BCAA products can still spike insulin and blood sugar levels, so we designed a series of products to ensure that you get what you need, all the while maintaining that epic state of ketosis. So let's make sure that your workout doesn't go to waste: meet Keto BCAA. Keto athletes shouldn’t have to sacrifice their fat-adapted state of ketosis in order to use in a quality intra-workout product. What makes Keto BCAA different from your standard branched- chain amino acid product? The main answer is that Keto BCAA contains BHB salts providing beta hydroxybutyrate, the primary energy source for keto dieters. It also contains a 2:1:1 ratio of branched-chain amino acids, with leucine leading the way. This is important because leucine is a ketogenic amino acid, and gets converted to ketones as well! Other "BCAA" supplements often contain several other amino acids, most of which are glucogenicand convert to glucose - the exact opposite of what a keto dieter wants. But that's not the case with Sparta Nutrition's Keto BCAA! Athletes and gym goers understand the vital role that amino acids play in the muscle repair process. Without branched-chain amino acids (BCAAs), the body can’t signal for the repair and rebuilding of muscle tissue. * The BCAAs are essential amino acids, meaning they need to come from food or supplementation for your body to get them! This is a significant problem for those who struggle to put on muscle mass yet aren't eating a ton of protein. A high-quality BCAA product will signal the Muscle Protein Synthesis (MPS) pathways in the body, which will allow the body to then utilize nutrients and amino acids to be used for muscle building. * Why train in the gym if you're not going to give your muscles a chance to adapt, grow, and recover? Keto BCAA is a keto athlete’s solution for the ultimate experience in energy and endurance, fat utilization, muscle tissue repair and maintenance, and recovery. * You don’t compromise in your training and now you don’t have to compromise with your supplements - even as a low-carb dieter. As a Keto-minded athlete, you want products to fuel your goals but have to be extra cautious to avoid products which may dampen your state of ketosis. Keto BCAA will ease your mind and become your go-to training partner. So what goes into Keto BCAA? Carbohydrates enhance training performance, so if we can't have them, can we utilize something else? The answer is very much yes. Keto BCAA packs a massive dose of Calcium BHB (2.5 grams), Sodium BHB (2 grams), and Magnesium BHB (1.5 gram) -- all minerals that get depleted when entering ketosis as it is! Keto BCAA uses a proven 5.5 grams BCAAs, at a proven 2:1:1 ratio. Keto BCAA packs 2.75 grams of Leucine, 1.375 gram of Isoleucine, and 1.375 gram of Valine. Sparta doesn’t offer average flavors. You spend hard earned dollars on your supplements for the best results, so what you buy should also be enjoyable to drink. We know you want to love your supplements from start to finish and we have delivered the ultimate taste experience. You should never compromise on the supplements you buy and with Sparta, you never will. 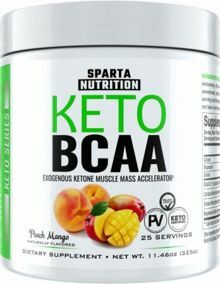 Choose the best, choose Sparta Nutrition's Keto BCAA.